With the Bush tax cuts set to expire on December 31, 2010, capital gains taxes will revert to 20 percent from their 70-plus-year low of 15 percent. In addition, barring legislative intervention, the tax rate on dividends will jump from 15.0 percent to 39.6 percent for top earners. When substantial tax code changes took effect in 1986, including a capital gains rate increase from 20 percent to 28 percent, investor liquidations nearly doubled the total realized capital gains from the previous year. Despite the decline in investment values over the last two years, many investors will likely follow this liquidation strategy, locking in their profits rather than waiting for investments to appreciate sufficiently to offset the 5 percent tax hike. Recent commentary by Treasury Secretary Geithner suggests the Obama administration will allow the Bush tax cuts to expire. The reluctance to endorse even greater rate hikes likely stems from concern more significant increases could further impede the economic recovery. 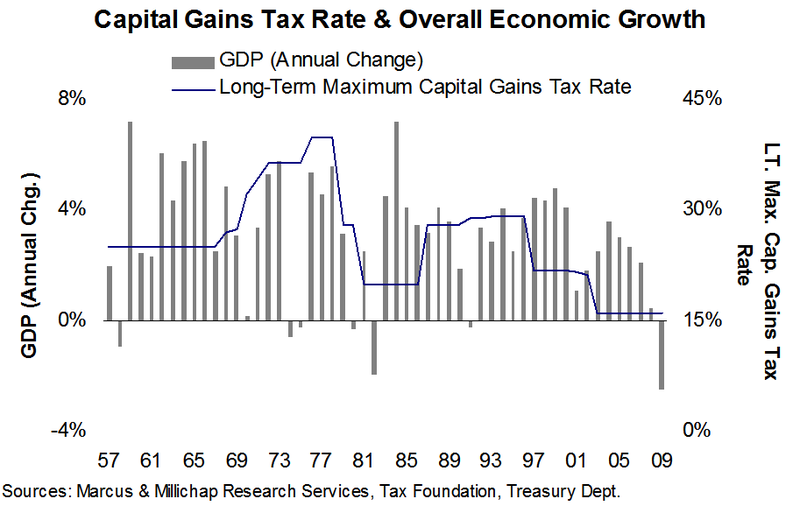 Considering long-term capital gains taxes have averaged 26 percent over the last fifty years, even hitting 40 percent in 1976 during the Nixon/Ford administrations, risk of further increases once the economy stabilizes remain high. As a result, though investors often choose to hold assets in the year following a rate hike, perceived tax-related risks may encourage them to continue selling assets in 2011. Apartments have taken the lead in the national recovery and will likely post notable occupancy and rent gains in major markets over the next year. Demand for retail and office space remains tepid, however, particularly in secondary and tertiary markets, placing downward pressure on rents and preventing owners from regaining substantive pricing power. For investors holding these assets, future capital gains tax increases could overshadow appreciation substantially, extending the hold period to break even against current net profits for several years. Investors who purchased these assets more than six years ago likely have profits to protect and may consider liquidating late this year. In response to the increase in capital gains taxes, commercial real estate investors’ ability to defer capital gains indefinitely through 1031 exchanges will become even more attractive. Since 2002, the year before the capital gains tax rate was reduced to a 70-plus-year low, the number of 1031 exchanges has fallen by nearly half. As capital gains taxes rise, the share of deals involving 1031 exchanges will increase substantially, as sellers will be further discouraged from taking profits from the investment real estate sector.